ABBOTT MOTORS, An exceptional car buying Experience, is offering this exceptional vehicle for sale. ABBOTT MOTORS has over 50 years of automotive experience! We are also a CARFAX Advantage Dealer. We offer great deals and specialize in FINANCING FOR EVERYONE-ALL CREDIT APPS ACCEPTED! We look forward to helping you purchase your next vehicle. CALL or TEXT (716) 229-5711 for quick answers to your questions about this vehicle. Your message will be answered by a real human never an automated system This Ford includes: 3.0L V6 FLEX FUEL ENGINE Flex Fuel Capability V6 Cylinder Engine Drive home in your new pre-owned vehicle with the knowledge you're fully backed by the CARFAX Buyback Guarantee. The Ford Escape XLT 4WD V6 w/Low Miles offers a fair amount of utility thanks to its advanced features and unique styling. It's also quite sporty, and injects an ample amount of handling chutzpah into the ridin'-high body of a family-friendly SUV. Where do you want to go today? With 4WD, you can choose to drive virtually anywhere and on terrain 2WD vehicles can't handle. This low mileage Ford Escape has barely been touched. It's the next best thing to buying new. This pre-owned Ford Escape looks like new with a clean interior that's been well-kept. 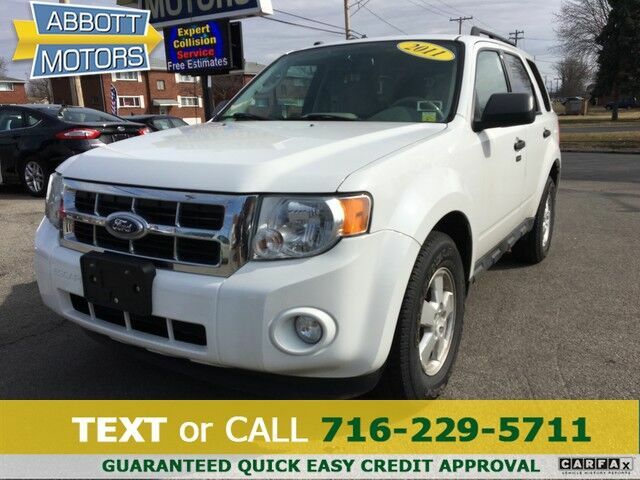 The perfect balance of speed and control has been injected into this 2011FordEscape. When this vehicle was shipped from the factory, Ford decided that no option should be left off of this magnificent automobile. So, if you're in the market for a Ford Escape XLT 4WD V6 w/Low Miles that is equipped with copious amounts of options, then we may just have the perfect vehicle to suit your needs. The brand new set of tires means that you will be able to drive off the lot without hesitation. You can drive off in the Ford Escape XLT 4WD V6 w/Low Miles feeling safe and confident with these new tires. This vehicle's exterior has been babied. The paint is in excellent condition with nearly zero flaws or signs of age. Upgraded wheel package makes this Ford Escape stand out from the rest. More information about the 2011 Ford Escape: The 2011 Ford Escape is one of the most affordable and economical small SUVs, and its car-like ride and handling, along with good maneuverability, make it a solid choice for urban drivers. The Escape is a Top Safety Pick award winner from the Insurance Institute for Highway Safety and has received a 5-star government rating in its crash testing. At the same time, the Hybrid model is one of the lowest-priced hybrids and offers a practical way to "go green." Last year's Escape Hybrid offered a fuel efficiency rating of 34 mpg city and 31 mpg highway. Interesting features of this model are competitive pricing, hybrid available, Smooth ride and handling, an eco-friendly vehicle inside and out, and fuel efficiency across the lineup STOP IN TODAY or Apply Online 24/7 at Abbottmotors.com ... All Trade-ins Welcome... Same Day Delivery... Call or Text Today and See The Difference... We Look Forward to Serving You! !This vehicle may be subject to potential open recall(s). Vehicle recall information may be found at Safecar.gov. Please verify price, equipment, options and features with your sales rep before your purchase. We Look Forward to Serving You. *Tax, title, plates extra. All Financing On Approved Credit. BBB accredited A+ member.